Welcome to Dennishill - North Ronaldsay. We offer a comfortable Self catering Cottage on the island of North Ronaldsay, the most northerly of the Orkney Archipelago. In North Ronaldsay you can have the peaceful and relaxing holiday you deserve, close to the sea and wild open spaces and away from the telephone, traffic and the pressures of everyday life. Dennishill can be found at the North end of the island, 2.5 miles from the airport and 3 miles from the island pier. 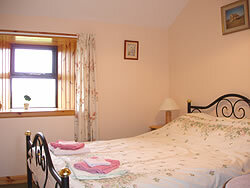 It is a recently renovated croft, which sleeps 4 in two bedrooms. The cottage is very well furnished, with private parking facilities, and is the perfect base from which to explore the island. A well appointed kitchen with a microwave, fridge-freezer and gas cooker. There are also facilities for washing and drying clothes. A comfortable sitting room, containing a feature fireplace and television with freeview. The cottage is heated throughout by oil central heating and there is no extra charge for electricity. Children are more than welcome to stay, however, we do not accept pets. There is no smoking allowed within the property. 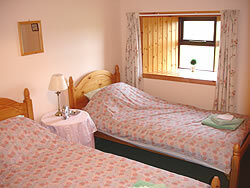 The cottage is available on a weekly basis. We also offer weekend and short break lets, so even if you just plan a quick trip to North Ronaldsay, please give us a shout! If you are looking to find the real Orkney, come to the North Isles and stay with us on North Ronaldsay and enjoy island life in this small rural community. There are several beaches close by where seals play within a stones throw of the shore and many different types of seabird circle overhead. Occasionally, pods of Killer Whales and Porpoise can be seen passing by and feeding in the productive waters off the island. The island's long history is steeped in tales of shipwrecks and of the lighthouses. The "new" lighthouse, in the North end of the island is Britain's tallest land based tower and is currently the only one in Scotland to offer guided tours. The "old" light situated close by was constructed in 1789 and still serves as a prominent landmark to shipping. As North Ronaldsay is only 4 miles long, the island can readily be walked from end to end. For the more adventurous, the 13 mile circumference of the island can easily be walked in a day and gives you a true feeling for the fresh air and remoteness. On a clear day Fair Isle and Sumburgh Head in Shetland are visible and clear nights sometimes offer spectacular displays of the Aurora Borealis or "Merry Dancers". North Ronaldsay is served by a weekly ferry service from Kirkwall. Flights to the island are subsidised and cost only £20 return (conditional on an overnight stay) making it one of the cheapest islands in Orkney to fly to.